A simple act you can do any day! 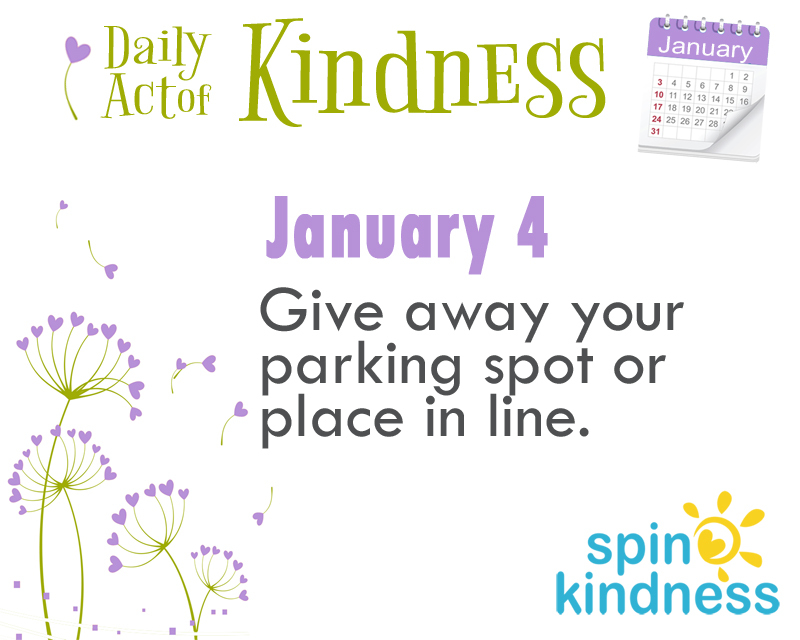 Today’s Challenge: Give away your parking spot or place in line. The malls and stores are still busy with post-holiday shoppers and people returning gifts. It’s the perfect time to give a gift that doesn’t even cost you: your spot! After you’ve circled around the parking lot and put your blinker on to “reserve” that prime spot just feet from the door, give it up. Make eye contact with another driver on the hunt, gesture to your spot, and turn your blinker off. Drive away with a smile. Or, wait until you’ve stood in line for a few minutes, watch for a tired shopper, and give them your place in line. Don’t let her go in front of you, give her your spot. Go to the end of the line and enjoy the kindness effect you just started. Be sure to tell us about your experience! Share it here in the comment or on Facebook or Twitter using hashtag #spinkindness.